Old GMC Pick-up Truck with a Gulf Sign! Photo Picture Classic Cars for sale & Classifieds - Buy Sell Classic Car & Classic Truck Classifieds. 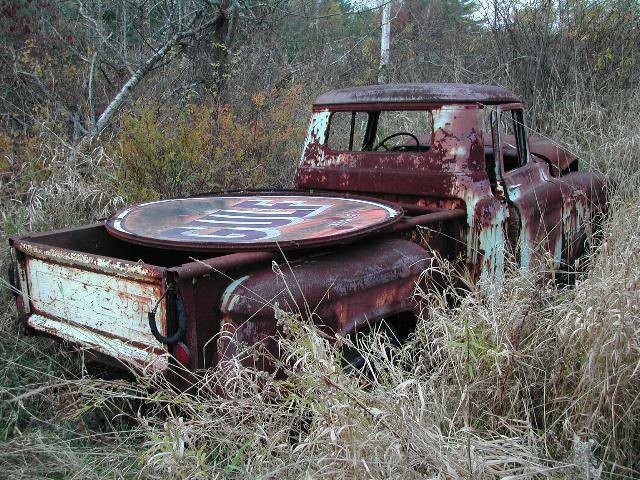 Car Photos > Rusty and Abandoned Classic Trucks > Old GMC Pick-up Truck with a Gulf Sign! Old GMC Pick-up Truck with a Gulf Sign! Old Gmc pick-up truck, out in the woods! Lucky for the new finder of this GMC as he was able to buy 2 sedans, several boxes of misc. parts and is still working on the sign and pick-up truck! that sighn would be funuhun in the winter i call the first run!! That sign would make a wicked toboggan!! I'd say forget about this one....way too much rust and damage front end looks buckled, shell looks too rusted....although?? ?